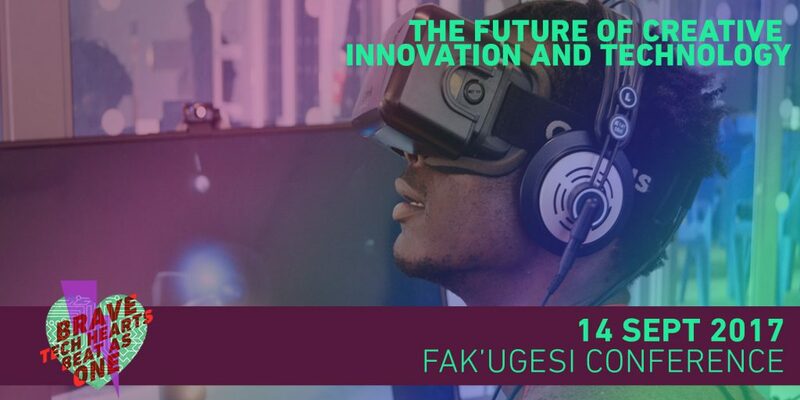 With its bold and daring theme of “brave tech hearts beat as one,” the 2017 Fak’ugesi African Digital Innovation Festival will once again pioneer uniquely African technology and creativity in an electrifying 10-day program, from September 6 to 16, to showcase the power of innovative collaboration. This year’s festival once again promises a unique, fresh, and exciting line up of events, including, for the first time, the Fak’ugesi Conference on September 14. This one-day event, titled “The Future of Creative Innovation,” sets its focus on highlighting important conversations on the role of collaboration and interdisciplinary practice for creativity, technology, and innovation in Africa. The 2017 Fak’ugesi Conference will take a closer look at the present and future of collaborative practices and digital culture in Southern Africa and the Sub-Saharan region. Panelists and keynote speakers will also engage questions around inter- and multidisciplinary digital practices in support of the growth of creative and community-led innovative technology in Johannesburg, South Africa and beyond. The day’s events will be introduced by one of South Africa’s most well-established fine artists, William Kentridge, in a keynote address titled “Enough and More Than Enough.” Kentridge’s immense intellectual generosity and interest in young Johannesburg makers and artists through the Center for the Less Good Idea, will lead to a panel discussion with Kentridge and the Center’s season 2 curators: Jamal Nxedlana, Nthlanthla Muthlangu and Tegan Bristow, chaired by Bronwyn Lace. Following this, two fascinating panels will address the state of virtual reality and mixed reality, their current uses, and the industry’s focus in South Africa. The first, supported by Maxum Digital (Innovation Hub) engages new South African practices in VR. The second, supported by Ericsson, takes a bold look at new mixed reality technologies and community-led urban design. These will run parallel to panels exploring the intersections of music, film and new technologies, in a double panel series curated by Weheartbeat in extension of the Fak’ugesi Beats Lab at the Festival. Each Fak’ugesi Beat panel features the cutting-edge beat makers and videographers that have come to contribute to the 2017 Fak’ugesi Beats Lab and Festival Finale. As one of the most distinguished ambassadors of digital culture and engagement in Africa, Jepchumba will deliver the second keynote address, titled “The African Digital Renaissance, New Frontiers and New Territories.” Jepchumba will then lead discussions into an extensive Pan-African conversation on questions facing digital culture on the continent. These discussions will also include contributions by participants in the ColabNowNow project: a 10-day program of digital storytelling and making that will take place during this year’s Fak’ugesi Festival. After an exciting and thought-provoking program, the 2017 Fak’ugesi Conference will close with a celebratory performance and beats demo by Fak’ugesi Beats Lab residents Masego from the UK and EvilNeedle from France. Want to Read Someone’s Mind? There’s an App, Well, You Know the Rest. Will Alaska’s Cleveland Volcano Eruption Disrupt Air Travel?